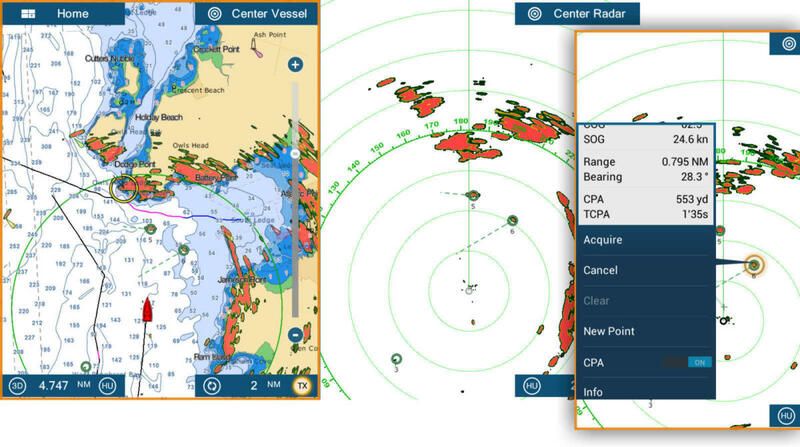 It went unmentioned at our large family Thanksgiving feast last week, but I am thankful that solid-state radar became omnipresent in our marine electronics world this year. In fact Gizmo&apos;s four test radomes now all share the solid-state virtues of near instant power up, low power draw, low emission levels, and long life (at least theoretical). They are all decent performing radars, too, and several offer very special features that only seem possible with solid-state technology. In this entry I&apos;ll try to sort out the field, while also sharing first impressions of that spanking new Garmin Fantom 24 radome. While the solid-state radome comparison table above -- click it bigger to see the detail -- took considerable time, please consider it a work in progress. Readers and manufacturers may have corrections, but it is a start at understanding the similarities and differences. For instance, the claimed maximum transmit power draw of these radomes only varies from 17 to 30 watts, or 1.4 to 2.5 amps at 12 volts (and I suspect that Furuno number is high in practice). 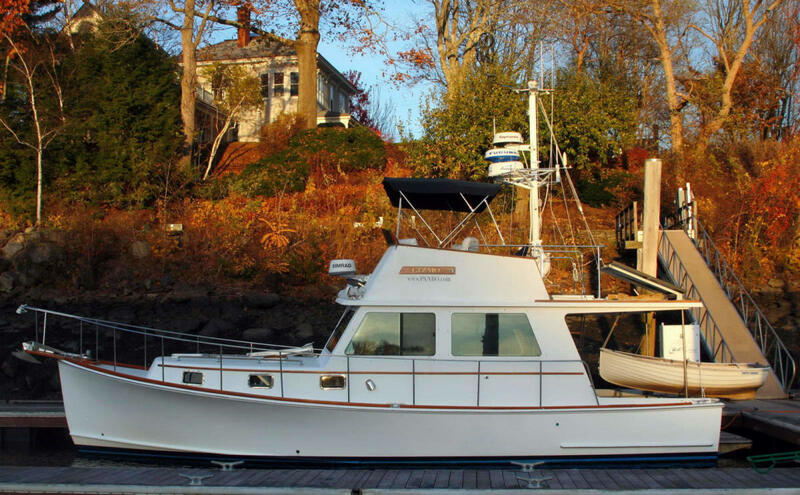 Low power draw is especially important on sailboats, but it also means lighter cables and easier installs on all boats. 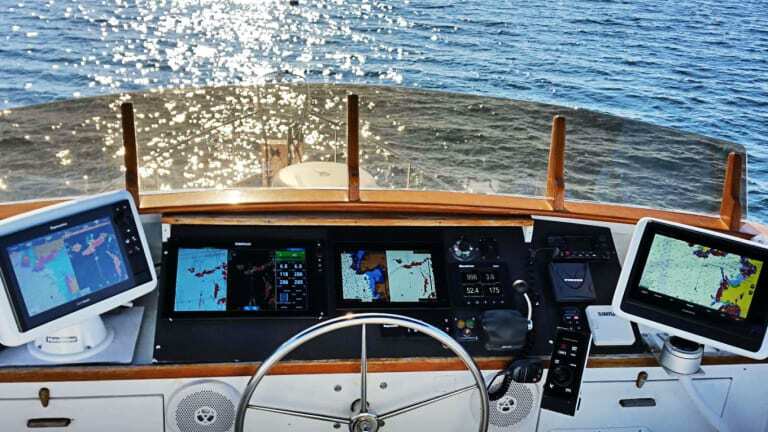 And though the standby draws are pretty much trivial, I&apos;ve still pointed out in the Extra Features column that both Navico (Simrad plus siblings B&G and Lowrance) and Raymarine let users turn the radars on and off from their multifunction displays. 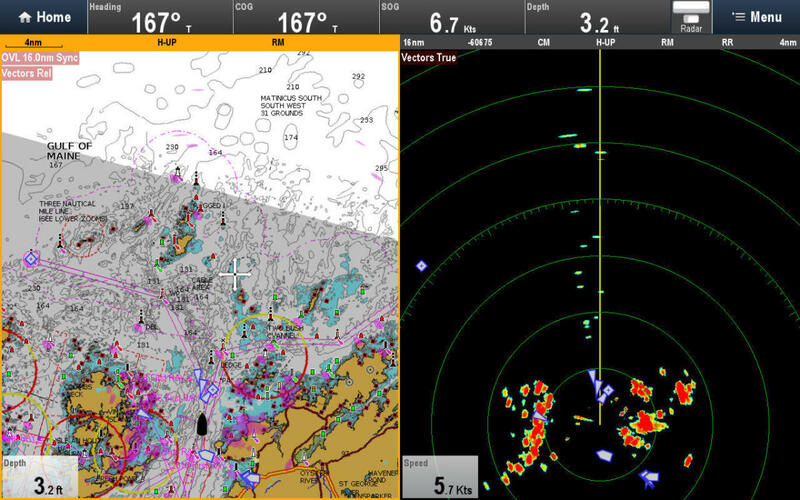 This feature, as well as Raymarine&apos;s unique WiFi utilization, are illustrated in Panbo&apos;s Quantum Q24C review. 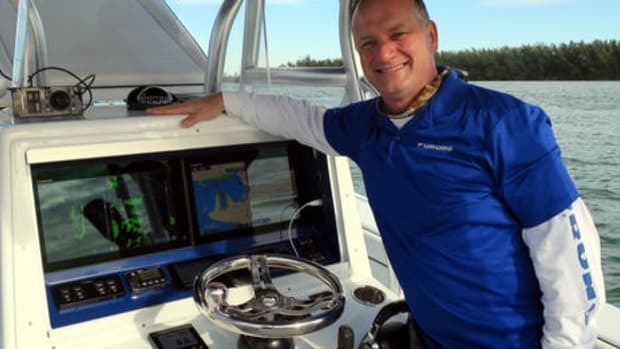 Speaking of which, strong evidence suggests that Raymarine is helping Humminbird to join the list above with a "HB 2124 CHIRP Radar" version of the Quantum Q24. 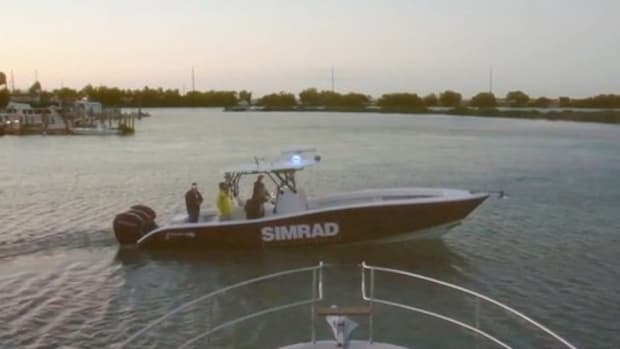 There may be five brands of solid-state radomes soon, and I say the more the merrier (and congrats to Humminbird and Raymarine for forging what looks like a smart partnership). 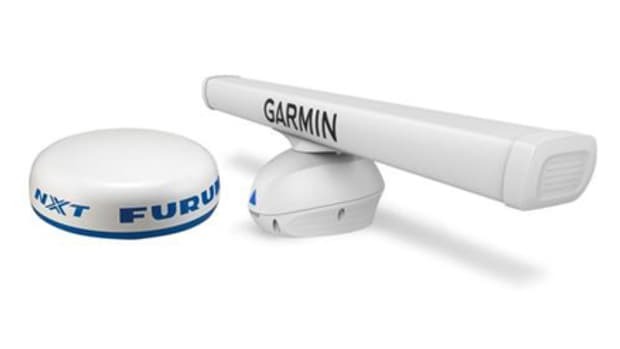 The Furuno and Raymarine radomes image that spot and other very close targets much like the Fantom, and the 3G/4G difference is probably due to their unusual FMCW solid-state radar technology. All the others use pulse compression instead of continuous wave, as reflected in the spec table&apos;s seemingly strange Output Watts column. Note, too, that this screen also shows how the 4G can overlay two independent radar ranges on charts, which was another unique feature and one I&apos;ve personally appreciated a lot. So it was great when I first opened the Garmin 7612&apos;s default Radar mode screen after installing the Fantom and saw Dual Overlay. It&apos;s also interesting because the original Fantom open array demoed in February had dual range, but only one could be overlaid on a chart. Almost all (current) MFDs and most of the devices attached to them are sometimes updated to add features (and/or fix bugs), but I think that solid-state radar is particularly prone because so many of the engineering teams are relatively new to the technology and the competition is fierce. 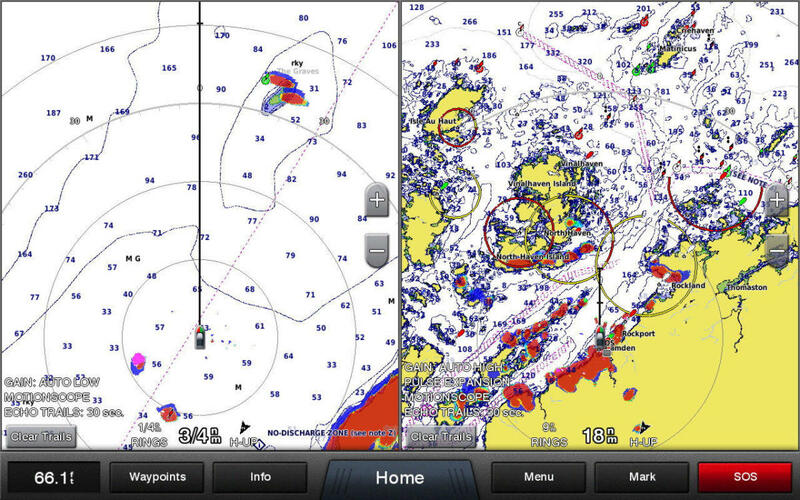 More dual overlay, Doppler, and automatic tracking features please. So here I have Fantom&apos;s dual overlay mode in action, and it turned out to be virtually the same mode as plain dual range, in a good way. That&apos;s because it only takes two finger (or GRID or wireless remote control) taps to find a neat little menu that lets you display (underlay?) charts on either or both ranges. 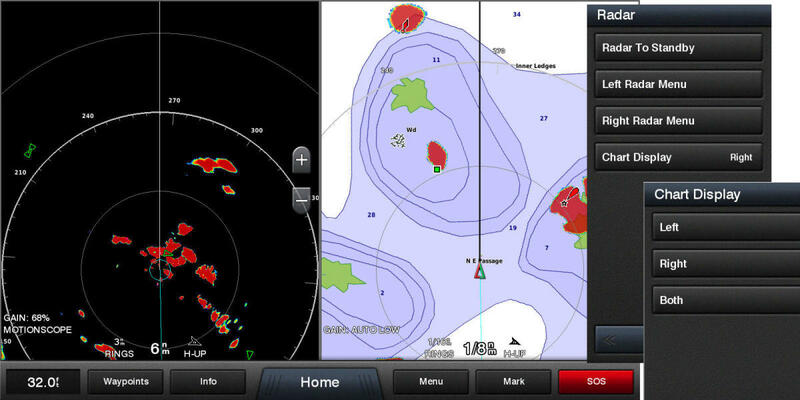 It&apos;s easier to set up the dual range and chart configuration you may want, or change it quickly, than it is on the 4G, but, then again, Garmin&apos;s dual range radar is a special mode that can&apos;t be mixed with other windows while you can mix radar ranges and overlays any way you want on NSS evo2 and Zeus2 screens. 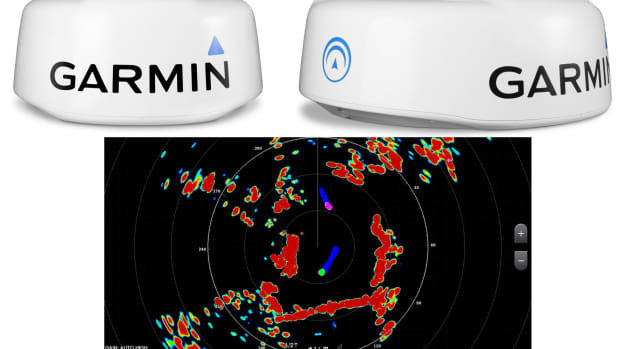 It&apos;s worth discussing how Garmin handles radar overlay with regular single-range radar because that too is different, not in a bad way. The collage above shows the main Radar Menu you&apos;ll see with any radar screen or window (dual range/overlay excepted), plus its major submenus. 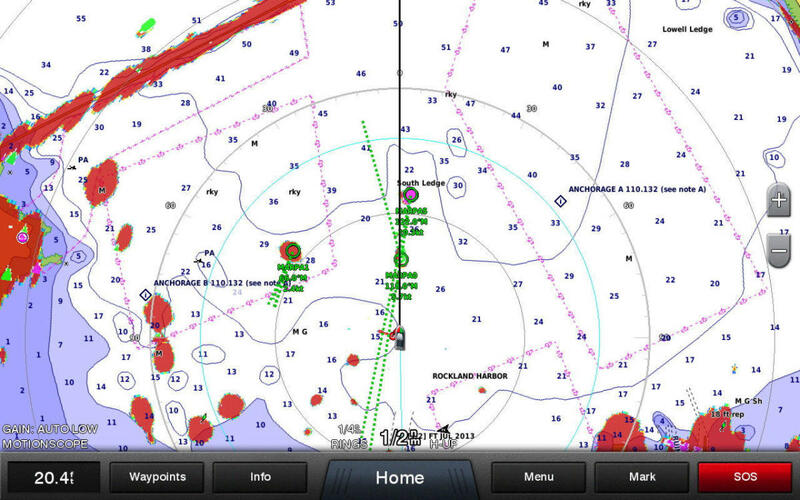 Note "Chart Display" at the top of the Radar Setup menu. 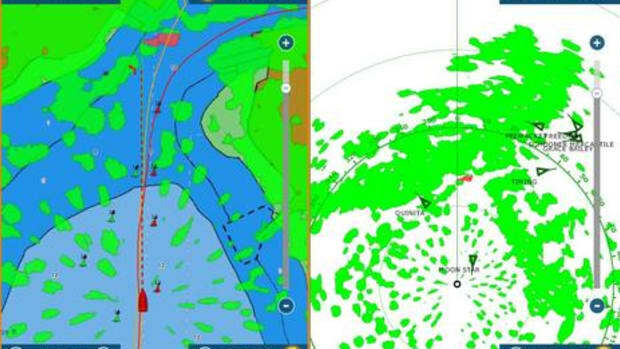 So, unlike all the other MFDs I&apos;m familiar with, you don&apos;t open a chart window and overlay it with radar; on Garmin&apos;s you open a radar window and underlay it with Chart Display. 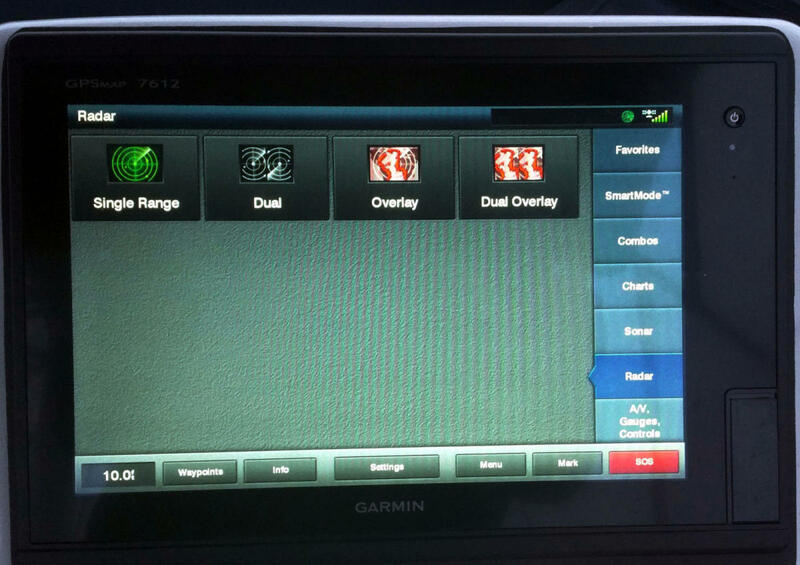 Of course the menus also show many other controls Garmin&apos;s latest MFD software provides for Fantom radars, and, in many cases, their magnetron radars as well. They are discussed rather briefly in a user manual like the 7612&apos;s (PDF download here) and if I fail to cover a detail that interests you in this or upcoming radar entries, don&apos;t hesitate to ask. Here&apos;s a Fantom 24 dual-range, dual-overlay screen, and I hope you can imagine how useful it could be in certain situations, like if there were rain cells out ahead that I was trying to dodge. I have not yet taken a stormy opportunity to compare these radomes (like 2012&apos;s 4G vs Ray HD in rain), but that will be interesting. It will also be good to do more long-range testing, especially because I was somewhat surprised that the fairly large Fantom 24 with its 40 watts of output didn&apos;t see further in situations like that 16nm range window at right above. I am aware that dual range means less on-target energy for each, but the results look similar with the Fantom 24 on single range, and also with manually increased gain. 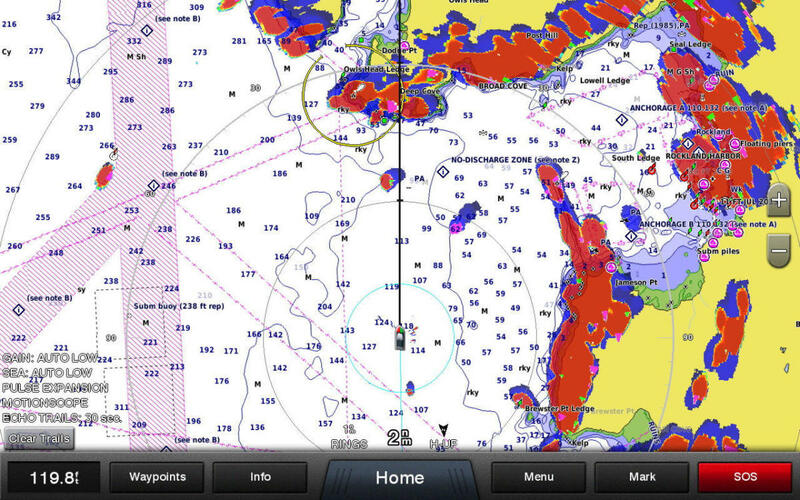 Garmin may need to do some Fantom radome tweaking -- heck, they&apos;re not even shipping quite yet -- but before we leave this screen, note how Fantom&apos;s Doppler-assisted MotionScope is purple highlighting a lobster boat that suddenly accelerated toward Gizmo&apos;s port quarter from 1/4 mile away. Useful! More on target tracking soon, but first check out this screen showing the Raymarine Quantum Q24 looking ahead at 16nm range. Panbo&apos;s initial Quantum testing is here and I took this screen before moving the Q24 up to the mast (where the WiFi data connection is still working fine and it can now see behind Gizmo). Yet its 20 watts of transmit power images quite like the Fantom&apos;s 40 watts in that important 8-mile range, plus it&apos;s peeking at a little of what&apos;s much further away, including a nav aid at 20 miles (I think). In fact, I&apos;m not sure that solid-state transmit power has that much to do with actual performance, but more testing is in order and software updates may change things. 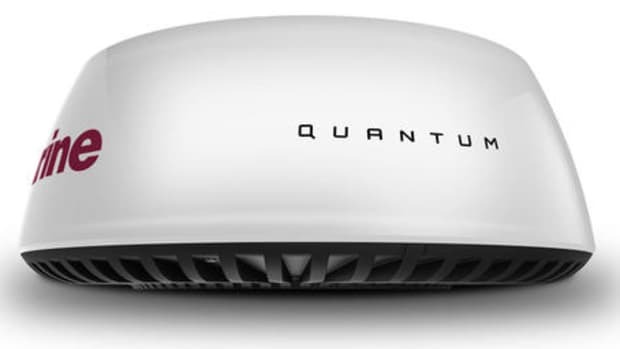 But let&apos;s also note that the super easy-to-install WiFi-only Quantum is about half the cost of the Fantom 24 and almost half the weight. But neither Quantum nor 3G/4G can currently provide the instant and automatic target assistance seen on this screen (though Doppler updates are vaguely rumored). I was motoring to Rockland in hopes of testing MotionScope on the state ferries, but the scenario got more realistic when I spotted two small speeding boats ahead but couldn&apos;t tell where they were headed. 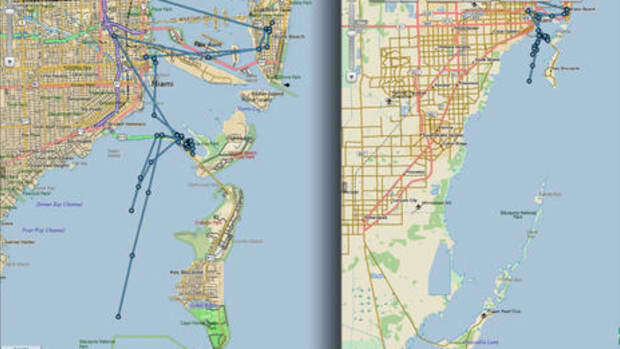 The purple target 2 miles off Gizmo&apos;s starboard bow says "vessel coming my way" and the longish echo trail says "fast." 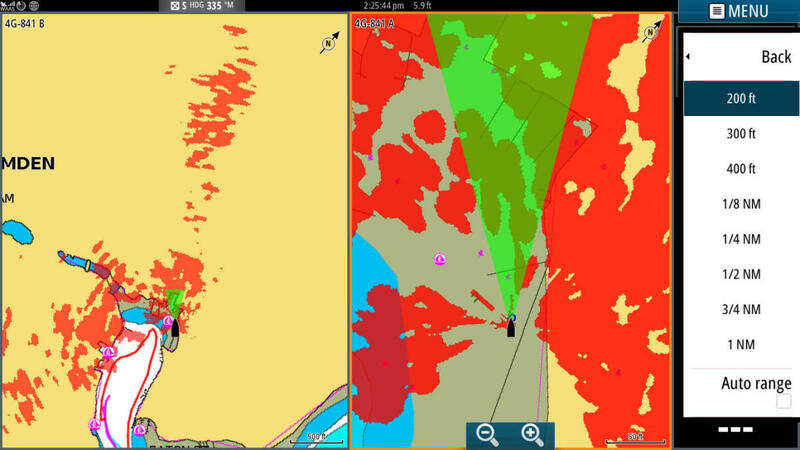 Interestingly, the other fast boat target -- just to port, a little over 2 miles away -- had shown purple just before I took the screenshot, and if you look closely it&apos;s just starting to turn all green, which will indicate that it&apos;s moving away. So far Fantom is the only radar using Doppler to show both coming and going target motion, as I saw in Miami, but several times I noticed the Fantom 24 briefly go thru this red phase as the relative motion changed. 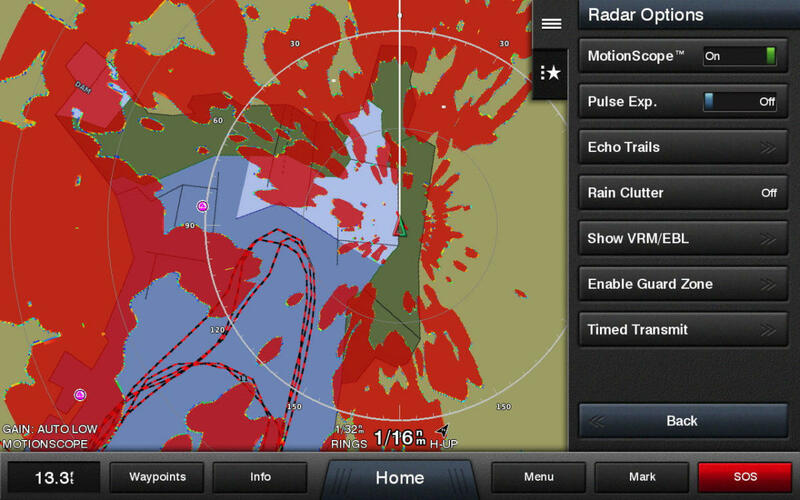 Incidentally, the latest Fantom MFD software offers a choice of seven different radar color schemes with automatic contrasting MotionScope colors, but only the red one shows "true color" target hardness shades. Also, that small purple incoming target behind Gizmo was yet another working lobster boat that was going the other way moments before. Finally, here&apos;s a Fantom 24 screen showing its MARPA capabilities, and it&apos;s particularly nice because the target calculations confirmed what the MotionScope was already indicating in a more general way. The target off to port was a little tug/barge combo and it&apos;s probably not highlighted because it was moving below MotionScope&apos;s speed minimum -- which is 5 knots, I think, while Furuno&apos;s is 3. Meanwhile the two boats ahead are above the speed threshold and MotionScope was already showing their going and coming nature before my MARPA selecting taps even began the calculation process and its more refined results. And notice how the Fantom is also highlighting a going away vessel on the other side of the rocky Rockland breakwater. So far the Fantom 24&apos;s MARPA seems a lot like what I see on the Quantum and the 4G. 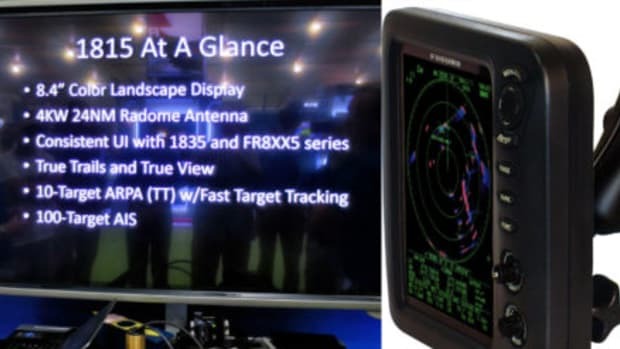 All can definitely be useful but none compares to the Furuno NXT ARPA even just in accuracy and speed, and the NXT also does an excellent job of picking which targets to track. With NXT no target tapping -- or accidental double tapping, as seen above -- is usually needed (though it&apos;s possible). But I&apos;ll repeat: these are all decent performing radars in my view, and that&apos;s good because you don&apos;t get to pick radar alone these days. What&apos;s more, I don&apos;t know of any reason that all the features highlighted here are not possible from any determined manufacturer, at least eventually. Behold the new world of solid-state radomes and rejoice.